For the UK-based American singer, see A Girl Called Eddy. Not to be confused with Erin Molan. Erin Marie Moran-Fleischmann (October 18, 1960 – April 22, 2017) was an American actress, best known for playing Joanie Cunningham on the television sitcom Happy Days and its spin-off Joanie Loves Chachi. Erin Marie Moran was born on October 18, 1960, in Burbank, California, and raised in nearby North Hollywood. She was the second youngest of six children born to Sharon and Edward Moran. Her father was a finance manager, and her interest in acting was supported by her mother, who signed her with an agent when she was five years old. Two of her brothers are actors: John Moran and Tony Moran, the latter of whom played Michael Myers during a scene in Halloween (1978). Moran's first acting role was at the age of five, in a television commercial for First Federal Bank. At the age of six, she was cast as Jenny Jones in the television series Daktari, which ran from 1966 to 1969. She made her feature-film debut in How Sweet It Is! (1968) with Debbie Reynolds, and made regular appearances on The Don Rickles Show in 1972, and guest appearances in The Courtship of Eddie's Father, My Three Sons, Bearcats!, Family Affair and in The Waltons, in an episode titled "The Song", in 1975. She also appeared in the television series Gunsmoke. In 1974, at the age of 13, Moran was cast to play her best-known role, Joanie Cunningham on the sitcom Happy Days, the feisty younger sister of Richie Cunningham (Ron Howard). Moran continued the role in 1982, in the short-lived spin-off series Joanie Loves Chachi, alongside Scott Baio, although she later stated that she had only reluctantly agreed to star in the series; she would have preferred to remain with Happy Days. She won the Young Artist Award for Best Young Actress in a New Television Series for her role. After Joanie Loves Chachi's cancellation in 1983, she returned to Happy Days for its final season. In the following years, Moran made several other television guest appearances, including The Love Boat, Murder, She Wrote, and Diagnosis: Murder, and starred opposite Edward Albert in the cult sci-fi horror film Galaxy of Terror (1981). She also appeared in The Waltons. In 2008, she was a contestant on VH1's reality show Celebrity Fit Club, two years later, she made an appearance in the independent comedy feature Not Another B Movie (2010). In 2013, despite reports that she would be reunited with Happy Days co-stars Henry Winkler, Ron Howard, and Scott Baio in the fourth season of Arrested Development, she did not appear in the revamped Netflix series. On April 19, 2011, Moran, three of her Happy Days co-stars—Don Most, Anson Williams, and Marion Ross—and the estate of Tom Bosley, who died in 2010, filed a $10 million breach-of-contract lawsuit against CBS, which owns the show. The suit claimed that cast members had not been paid merchandising revenues owed under their contracts. Revenues included those from show-related items such as comic books, T-shirts, scrapbooks, trading cards, games, lunch boxes, dolls, toy cars, magnets, greeting cards, and DVDs with cast members' likenesses on the box covers. Their contracts entitled the actors to be paid five percent of the net proceeds of merchandising in the event that a single actor's likeness was used, and half that amount in the event that the cast members were pictured in a group. CBS said it owed the actors between $8,500 and $9,000 each, most of it from slot machine revenues, but the group said they were owed millions. The lawsuit was initiated after Ross was informed by a friend playing slots at a casino of a Happy Days machine on which players won the jackpot when five Marion Rosses were rolled. In October 2011, a judge rejected the group's claim of fraud, thereby eliminating the possibility of recouping millions of dollars in damages. On June 5, 2012, a judge denied a motion to dismiss filed by CBS, which meant the case would go to trial on July 17 if not settled by then. In July 2012, the actors settled their lawsuit with CBS; each received a payment of $65,000 and a promise from CBS to continue honoring the terms of their contracts. In 1987, Moran married Rocky Ferguson; they divorced in 1993. Later that year, she married Steven Fleischmann. After Happy Days and Joanie Loves Chachi were canceled, Moran moved from Los Angeles to the California mountains. She said in 1988 that she suffered from depression and was unable to gain acting roles. Moran confirmed news reports that her California home was foreclosed in 2010, following media claims that she had been served eviction papers and moved into her mother-in-law's trailer home in Indiana. In 2017, Variety magazine said she "had fallen on hard times in recent years. She was reportedly kicked out of her trailer park home in Indiana because of her hard-partying ways." On April 22, 2017, authorities in Corydon, Indiana, were alerted about an unresponsive female, later identified as Moran. She was pronounced dead, aged 56. An autopsy report from the Harrison County coroner indicated the cause of death to be complications of stage four squamous cell carcinoma of the throat; toxicology testing showed that no illegal narcotics were involved in her death, and no illegal substances were found in Moran's home. Moran's husband, in an open letter released through her co-star Scott Baio, confirmed that she had first experienced symptoms of throat cancer around Thanksgiving 2016 and deteriorated rapidly from that point, and that the facilities that had unsuccessfully attempted to treat her cancer had not made anyone aware of how badly the cancer had metastasized. ^ Puente, Maria. (April 24, 2017). Autopsy: 'Happy Days' actress Erin Moran likely died of cancer. usatoday.com. Retrieved April 27, 2017. 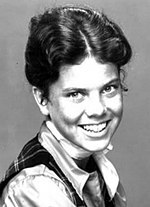 "Erin Moran-Fleischmann, who was best known for playing Joanie Cunningham ..."
^ Heldman, Breanne (April 22, 2017). "Erin Moran, Happy Days star, dies at 56". Entertainment Weekly. New York City: Time Inc. Retrieved April 23, 2017. ^ "Actress Erin Moran of 'Happy Days' Dies at 56". Voice of America. Washington, D.C.: Broadcasting Board of Governors. Associated Press. April 22, 2017. Retrieved April 23, 2017. ^ a b c d Haag, Matthew (April 22, 2017). "Erin Moran, Who Played Joanie on 'Happy Days,' Dies at 56". The New York Times. New York City: The New York Times Company. Retrieved April 23, 2017. ^ a b Italie, Hillel (April 22, 2017). "Erin Moran, Joanie Cunningham in "Happy Days," dies at 56". Associated Press. New York City: Board of Directors of AP. Retrieved April 22, 2017. ^ Rossi, Rosemary (April 22, 2017). "Erin Moran, of 'Happy Days' and 'Joanie Loves Chachi', Dead at 56". MSN. United States: Microsoft. Retrieved April 22, 2017. ^ Newman, Jason (April 22, 2017). "Erin Moran, Joanie in 'Happy Days,' Dead at 56". Rolling Stone. New York City: Wenner Media LLC. Retrieved April 23, 2017. ^ Sterling, Joe; Marco, Tony (April 22, 2017). "Erin Moran, 'Happy Days' actress, dead at 56". CNN. Atlanta: Turner Broadcasting System (Time Warner). Retrieved April 23, 2017. ^ Helsel, Phil; Dicasimirro, Gemma (April 22, 2017). "Erin Moran, Who Played Joanie on 'Happy Days', Dead at 56". NBC News. New York City: NBC. Retrieved April 23, 2017. ^ a b Ellis-Petersen, Hannah; Collins, Pádraig (April 23, 2017). "Erin Moran, actor who played Joanie Cunningham in Happy Days, dies at 56". The Guardian. ISSN 0261-3077. Retrieved April 24, 2017. ^ Crouse 2005, pp. 42–43. ^ "Joanie Loves Chachi: Season 1". Metacritic. United States: CBS Interactive. Retrieved April 23, 2017. ^ a b Aiello, McKenna (April 22, 2017). "Happy Days Star Erin Moran Dead at 56". E!. Los Angeles: NBCUniversal Cable. Retrieved April 23, 2017. ^ a b Calvario, Liz (April 22, 2017). "Erin Moran Dies: 'Happy Days' Actress Was 56". Deadline Hollywood. United States: Penske Media Corporation. Retrieved April 23, 2017. ^ "Happy Days actress Erin Moran dies at 56". BBC News. April 23, 2017. Retrieved April 24, 2017. ^ Deerwester, Jayme (April 22, 2017). "'Happy Days' star Erin Moran dies at 56". USA Today. McLean, Virginia: [Gannett Company]]. Retrieved April 23, 2017. ^ Bowman, Emma (April 22, 2017). "Actress Erin Moran, Joanie Of 'Happy Days,' Dies At 56". NPR. Washington, D.C.: Independent. Retrieved April 23, 2017. ^ "'Fonzie' Reaches Out to Help Down-and-Out Erin Moran". New York Post. New York City: News Corp. October 17, 2012. Retrieved February 1, 2013. ^ Glynn, Michael (October 17, 2012). "Homeless Erin Moran: The Fonz to the Rescue!". National Enquirer. New York City: American Media Inc. Retrieved February 3, 2013. ^ Zamost, Scott (April 20, 2011). "'Happy Days' actors claim fraud, money owed for merchandising". CNN. Atlanta: Turner Broadcasting System (Time Warner). Retrieved April 23, 2017. ^ Gardner, Eriq (June 5, 2012). "'Happy Days' Actors Win Key Ruling in CBS Lawsuit". The Hollywood Reporter. Los Angeles: Eldridge Industries. Retrieved April 23, 2017. ^ Zamost, Scott (June 5, 2012). "'Happy Days' cast members' lawsuit heading for trial". CNN. Atlanta: Turner Broadcasting System (Time Warner). Retrieved April 23, 2017. ^ Zamost, Scott (July 7, 2012). "'Happy Days' actors settle lawsuit with CBS". CNN. Atlanta: Turner Broadcasting System (Time Warner). Retrieved April 23, 2017. ^ a b Bucher, Chris (April 22, 2017). "Steven Fleischmann, Erin Moran's Husband: 5 Fast Facts You Need to Know". Heavy.com. Heavy Inc. Retrieved April 23, 2017. ^ De Nunzio, Miriam (April 23, 2017). "Erin Moran, starred as Joanie on 'Happy Days,' has died". Chicago Sun-Times. Chicago: Sun-Times Media Group (Wrapports LLC). Retrieved April 23, 2017. ^ Chaney, Jen (April 19, 2011). "'Happy Days' cast members file lawsuit". The Washington Post. Washington, D.C.: Nash Holdings LLC. Retrieved April 22, 2017. ^ Marikar, Sheila (June 8, 2012). "'Happy Days' Star Erin Moran Living in Trailer to Help Ailing Mother-in-Law". Good Morning America. ABC News. Retrieved April 22, 2017. ^ Oldham, Stuart (April 22, 2017). "'Happy Days' Star Erin Moran Dies at 56". Variety. Los Angeles: Penske Media Corporation. Retrieved April 22, 2017. ^ "'Happy Days' Star Erin Moran Dead At 56". TMZ. Los Angeles: Time Warner. April 22, 2017. Retrieved April 22, 2017. ^ Nolasco, Stephanie (April 25, 2017). "Erin Moran's husband reveals her tragic final days with skin cancer". foxnews.com. Retrieved April 27, 2017. ^ Warner, Kara (April 24, 2017). "Erin Moran's Happy Days Costar Anson Williams Reveals She Was Unable to Speak Due to Throat Cancer: 'We All Kept Quiet out of Respect'". People. Retrieved April 25, 2017. ^ Sayers, Justin (April 24, 2017). "'Happy Days' star Erin Moran likely died of cancer, Harrison County coroner says". The Courier-Journal. Retrieved April 24, 2017. Crouse, Richard (2005). Reel Winners: Movie Award Trivia. Toronto: Dundurn Press. pp. 42–43. ISBN 978-1550025743. Wikimedia Commons has media related to Erin Moran.